The solution is simple to remove only one or more updates from Windows 10, this example is also for Windows 7 and Windows 8.1 suitable! Then you can immediately remove some installed auto update from your Windows 10! 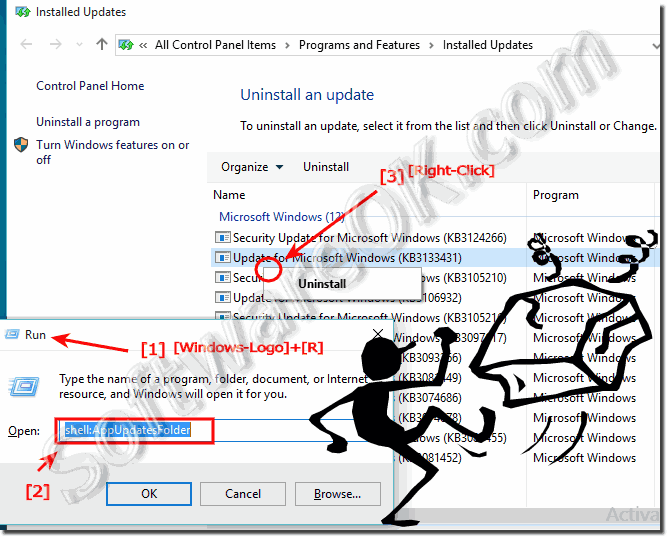 (Image-1) Uninstall an auto update from Windows-10! With Windows 10 automatic updating, you don't have to search for updates online or worry that critical fixes for Windows 10 might be missing from your computer. Windows 10 automatically checks for the latest updates for your computer. Depending on the Windows Update settings you choose, Windows can install updates automatically or just let you know they're available. Windows 10 Update contains software tools that detect information about your computer, such as the make and model and the Windows 10 version and other Microsoft software that your Windows-10 computer is running. Microsoft uses that information to install only the updates your computer needs. Windows-10 - FAQ-142: Remove a update from Windows 10, how to?